So with our first news post after some downtime it’s only fitting it pertains to Zelda, and even more fitting it pertains to Ocarina of Time 3DS. This bit of “faithful reproduction” news will assuredly be a bit of a downer for some fans. Many were holding out hope of additional dungeons (such as ones that were started and never finished and/or cut from the final release) or some new area that got scrapped. Unfortunately for those people it appears that the game is nothing really other than a straight “port”. Improved graphics, some neat gyroscope things with aiming, and an improved control and user interface screen appear to be it for major changes. I’m not overly upset about it: Just like every other game that is rereleased I was never expecting much to change. It was simply bringing one of the best games ever into the 3D perspective as it’s main objective and apparently it does that very well. Naturally I’m still purchasing it because I want to experience the game in 3D first hand, but this really has to make you scratch your head on how 19% of voters are looking more forward to Ocarina of Time 3DS than Skyward Sword. Do you guys really hate the SS graphics that much? 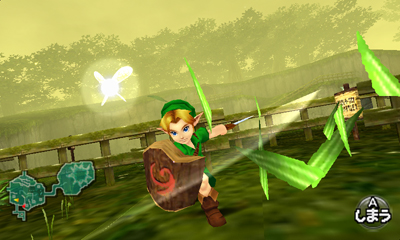 We’ve played Ocarina of Time at least 3 times: Original release, Master Quest collectors edition, and on the Wii VC.